Homemaking is an art. Every home has its own unique way of presenting itself. Interior designing, furnishing and all create a combined effect on the art of living. Tapestry, an icon of luxury living, is no more a luxurious good for you to dream about. High quality handmade tapestries for your home are available in different designs for you to select. Tapestries were used as symbols of the noble centuries ago. Woven textile art was used to make tablemats, placemats, cushion covers and tea towels etc. Creativity and artistry added to tapestries made them more of home decors rather than household utensils. We offer a series of unique and exquisite tapestry products at our online store for you to select to match with your living room theme. Finest quality tapestry placements come in packs of six classy pieces decorated with matching patterns. Both round and square type placements are available. Good quality material is used to ensure high usability and durability of these products. Select from an array of different patterns and colours available as per your need. Vintage floral patterns are for universal use. They will decorate your living room and dining room equally. Tapestry tablemats are cues of luxury living as mentioned previously. More than their primary use as tablemats, these are used as home decors. 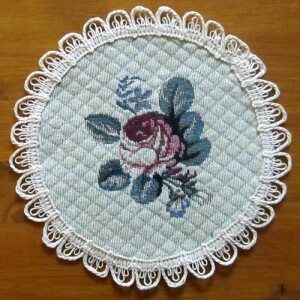 Tablemats come as one piece products in round shape or square shape. These are all high quality handcrafts made with assured quality. Tablemats are also available in round and square shapes with a range of different patterns. Oval shape tablemats are a new addition to our tapestry tablemat series. All have been woven paying such attention to every detail on the mat. Finest quality material ensures durability of the tablemats along with their high usability. Another household utensil, yet extra special and designed with more focus on the art of living. Tapestry tea towels are meant for a rustic setting, however they suit as a décor in your living room or dining room equally. Floral patterns on the tapestry tea towels feature vivid color beautiful vintage flowers matching the background. Tapestry tablemats, tea towels and placements are all great gift ideas. They are high quality and absolutely unique in presence. Highly recommended for house warming parties and homecomings. Select from an array of tapestry products online to select the best matching items as per your requirement.